I went back home 9 years ago with my husband to show him my country where i grew up. 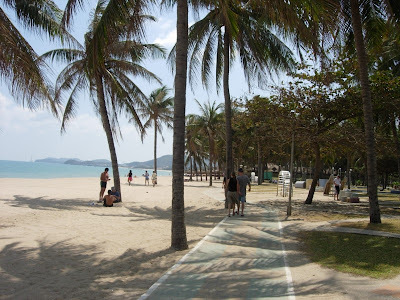 We had a chance to visit Nha Trang, our favorite place in Viet Nam, besides Ha Long bay and Hoi An. 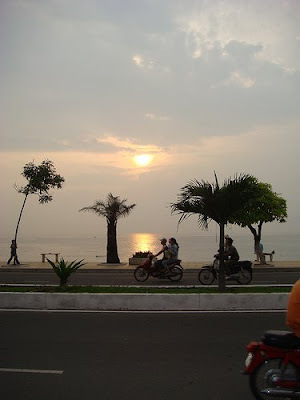 Nha Trang is a coastal city and the capital of Khanh Hoa province, on the south central coast of VN. It is well known for its prestine beaches and excellent snorkeling, scuba diving and is fast becoming a popular destination for international tourists, attracting large numbers of backpackers. It was the site of the Miss Universe 2008 pageant. 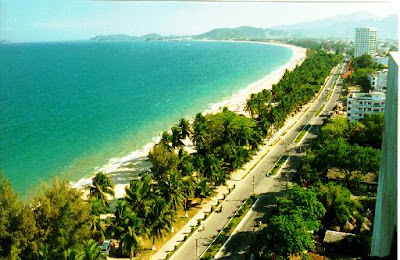 Nha Trang bay is among the world’s most beautiful bays. Visiting a fishing village and taking a fresh lunch at the island are among the fun things to do. I highly recommend it to those who have a chance to travel to Viet Nam. 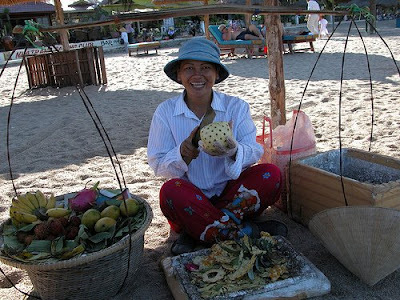 Lady selling tropical fruits along the beach. 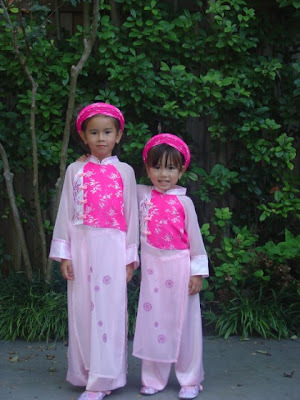 I wore a Vietnamese traditional dress (called Ao Dai), 9 years ag0 . Sorry for bad quality picture. 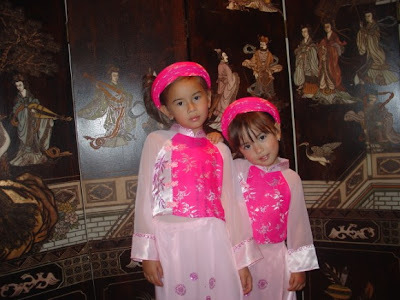 Here is something extra; 9 years later, I dress my girls in Ao Dai (Vietnamese traditional dress). What do you think? I love to dress them up. Let don’t talk about food, traveling to places, either culture. Let talk about shopping and let visit the store 4510 in Dallas. Melisa who is a sale person at 4510 called me to come to take a look at Buddha necklaces from Kimme Winter collection. Too bad, there were nothing that I love. Instead, I saw some jews from The Woods jewelry line. They are in Aspen and each pieces is hand made with rare material. The shorter necklace, the chain is made of horn and the pendant inlaid with rose diamond, also horn-both woolly mammoth horn. 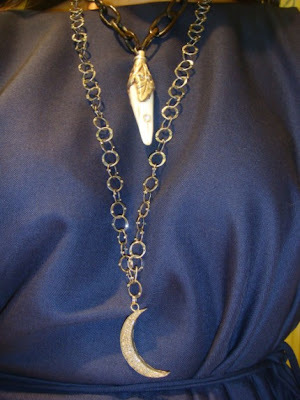 The longer necklace has a moon pendant and I like it because of its chain. The ivory bracelet, the beads are made of woolly mammoth tusk and the piece hanging is horn. The beads of black bracelet are black coral, it is Abejas jewelry line from Houston. I think these two bracelets are compliment together. Before I bought these jews, I was thinking… should I? because I do not want their deaths gave up for my jews. 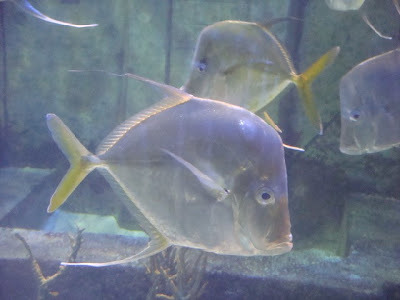 Since they are extint species so I think it is ok. I also learn from google that mammoth is a common menber in the fossil record, but unlike many others are often not actually converted to stone, but are actually preserved since their deaths. This is in part because of their massive size and partially because of the persistence of the frozen climate in which they had lived and, therefore, died. Me: I wore Matthew Ames dress, Pierre Hardy shoes. Hello everyone,Time is passing fast, summer is on its way. Many of you are probably thinking about a break from work or school….for a little vacation. To get an idea where is your next destination : beach, mountain, big cities or little town to relax. 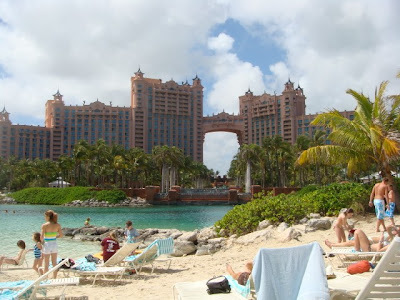 Therefore, I would like to share with you our spring break vacation at Bahamas. 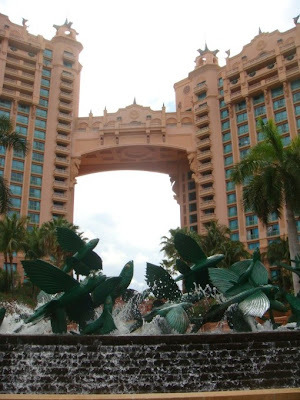 We stayed at the Atlantis Hotel, Nassau island. 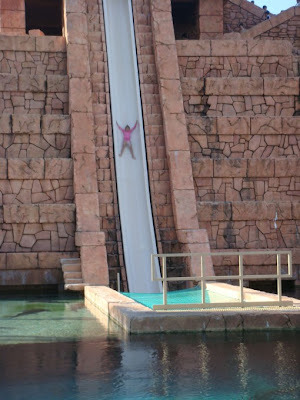 It’s massive and has everything from casinos for the adults, a shopping village, an array of restaurants from casual to fancy, a night club, a movie theater for the teenagers, a water playground for the kids, and Dolphin Cay where you can swim with them. They also feature five different towers for different prices depending on how much you want to pay for the stay, you can get a good deal , $399 for 3 nights. It’s like they built their own city. The hotel is incredible and has impressive service. 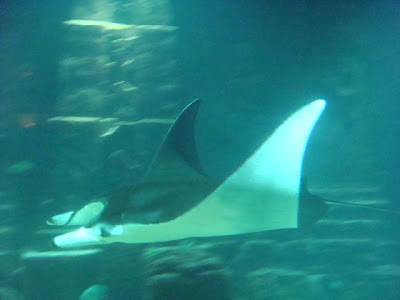 Oh, the water rides are unbelievable, from the scary pyramid slide called “Leap of Faith” to the lazy river ride… And aquarium is simply amazing, it’s the world’s largest open air aquarium, stocked with thousands of marine animals including sharks and sting-rays (it’s the biggest sting-rays I’ve ever seen on screen or in person), six exhibit lagoon, waterfalls…. 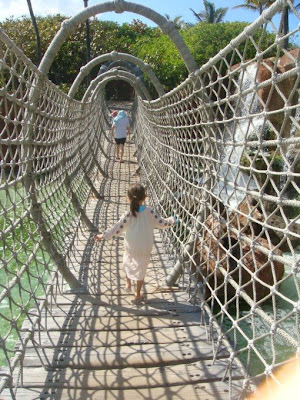 It’s quite the experience and truly fun for everyone. The Bahamas, originally called “Baja mar”, for the Spanish term meaning shallow waters or sea, the name”Bahamas” effectively means “The Island of The Sea” . The beach has white sand accompanied by a beautiful turquoise blue ocean. The Bohemian people are extremely nice and honest. They love meeting people and making friends. The kids really want to go back soon. 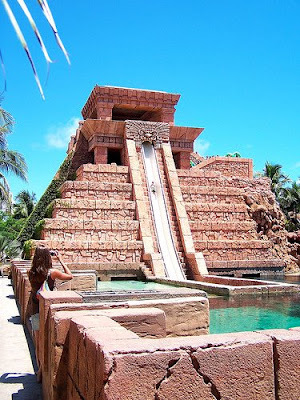 To me, The Bahamas is great for everyone because you could relax at the beach, ride exciting water rides, get your heart beating at the casino, and be wild at a night club, choose from many different restaurants, spend your money at shopping village…. Las Vegas, here it comes, an internationally renowned major resort city of gambling, shopping, fine dining and entertainment. This was my fourth time there. 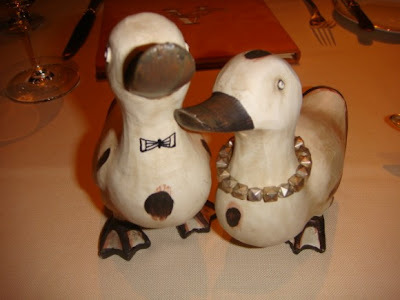 My husband and I usually go there for fine dining and seeing shows, not much gambling (we are dining crazy and become chickens when it comes to gambling). 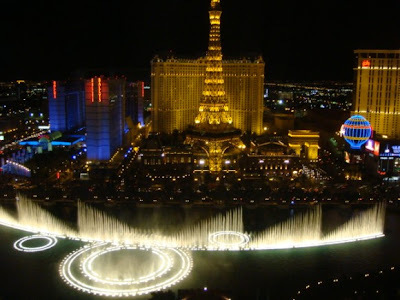 We normally take a short trip (2 days or even 24 hours) to Las Vegas to feel young, wild , and free …..We usually stay at Bellagio. When we arrive at the hotel, we have Dim Sum right away. It is our new tradition in Las Vegas. 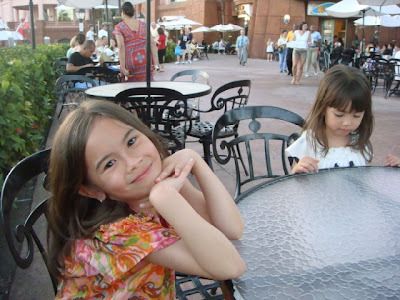 This time, we spent 24 hours there to see Nini and her boyfriend Loc. My husband and I had a couples massage, it was fabulous. Then I met Nini right after that for a little girl chat and shopping. 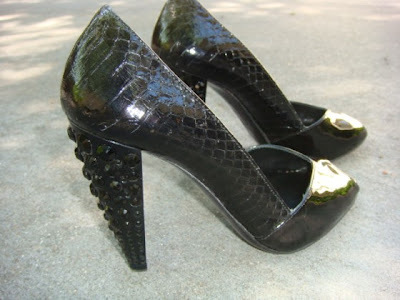 On the phone with Nini: I wore Club Monaco dress, Helmut Lang tank, Ann D sandal. Nini and I at Bellagio. We had dinner at Alex restaurant, at the Wynne. I wore a Rick Owen top, Balenciaga legging, limited edition Guissepi sandal, MMMargiela necklace. This is a gift from Nini to us for our anniversary. Is it cute? We love them. Thanks Nini, you’re very sweet and thoughtful. Night view from our window room at Bellagio. Good bye Las Vegas. I was at LV airport waiting, wore Comme des Garcons top and legging, Ann D sandal, Lanvin bag, and my new purchase YSL mini bag from YSL boutique at Bellagio. Close up YSL mini bag, Rings from F21. We surely had short time there but absolutely a great time. Nini and Loc are going back to Dallas on Monday. Hope you all have good Sunday! Dallas’s weather lately is pleasant in the morning, then it reaches to 87F around 4 o’clock in the afternoon. We start to feel a little hot. A couple of nights ago , we both felt hot and we were thristy for a cold drink, maybe beer?, maybe champagne?…We both voted for champagne, French style, an elegant way to cool us down. Here we come, happy hour! 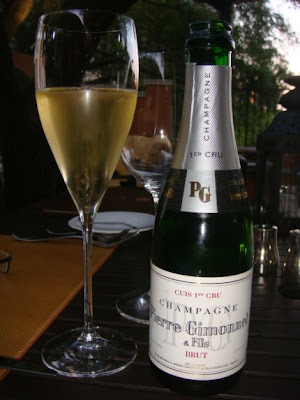 Champagne is a complement to seafood dishes or a fried , oily food. It is a way to cool down, just like beer, but in much more glamorous way. We ordered French style snails and oysters to go with our drinks. Seating was outside , drinking cold champagne was absolutely great and did not feel hot at all, but pleasant and I am grateful for that. I wore Dries Van Noten top, Theory pants, Ysl shoe, F21 ring. 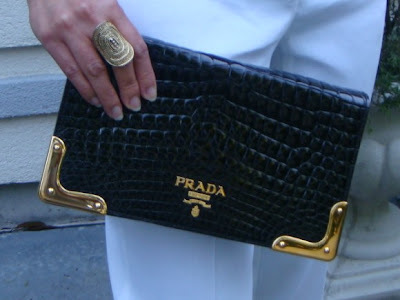 Crocodile Prada clutch, made exclusively for Neiman Marcus ,100 years birthday. It’s a Christmas gift 2 years ago. A couple of nights ago, I cooked a dish called “Tom kho tau”, Vietnamese cuisine, my translation to English is ” sauted prawn with its roe”. Someone might know this dish and may help me to translate it right It is one of my husband’s favorite dishes. 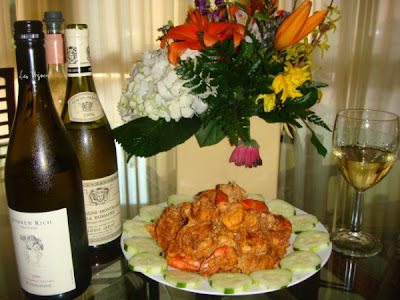 There are many ways to prepare this dish, but it pretty much has these ingredients : whole fresh water prawns imported from Vietnam or Thailand ( these two countries are well known for those prawn exporters), minced garlic, chopped onion, black pepper, chili powder for spicy flavor, salt, fish sauce , sugar and of course their roe. It’s a seafood dish and white wine is recommended. We opened a few to experiment with it like: Andrew Rich 06, Roussanne, Columbia Valley, Washington; Bonny Doon Vineyard, NV, also from Washington; Chassagne-Montrachet la Romanee’ 96 ,French. 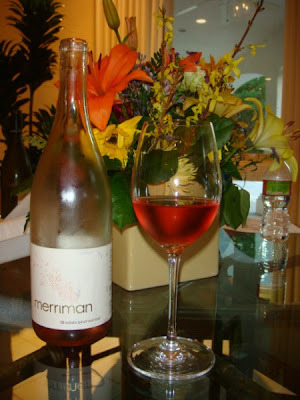 Merriman estate 08 pinot noir rose’, Oregon was the one that complimented the savory flavor of the dish. Voila, Bon apetite . We had a great dinner. After meal, we went out casual for after dinner drink. I wore Zero shrug, Helmut Lang tank, Current/Elliot jean, MMMargiela necklace, YSL shoes, F21 rings. 10 Questions for The Dalai Lama. 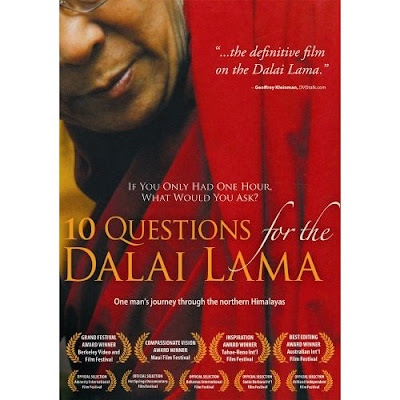 The last time I was on the flight to Portland, I had a chance to see the movie “10 Questions for the Dalai Lama”. It’s directed by Rick Ray, and is a documentary about Tibet and the life of the Dalai Lama. It gives a view of who the Dalai Lama really is, told through both archival footage and the questions are asked directly to him during an audience. Ray traveled to India to meet him alone in his monastery. The questions mostly inquire as to the Dalai Lama’s opinion on the conflicts in the world, but also deal with finding happiness on a personal level and on a more global level. Why do the poor often seem happier than the rich? Must a society lose its traditions in order to move into the future? How do you reconcile a cmmitment to non-violence when face with violence? Can we save our environment? Despite the very serious matter(a people in exile, oppression, suffering and loss of a whole culture) the movie- actually the Dalai Lama – has a contagious laugh. The D.L. still manages to put a smile on your face. More importantly, he makes you think, the wisdom of an extraordinary spiritual leader. His books sell everywhere in bookstores and thousands come to hear him lecture. I certainly recommend it to anyone who wants to know about Tibet and the Dalai Lama. To his people, he is like a God. To the west, he is a celebrity. To China, he is the enemy. To him, he is just a simple monk. About this time of the year, my kids’s school has a gala night, one of the biggest parties of the school year to raise funds. Lots of parents are excited about it, and ask lots of volunteers to work to make it successful. 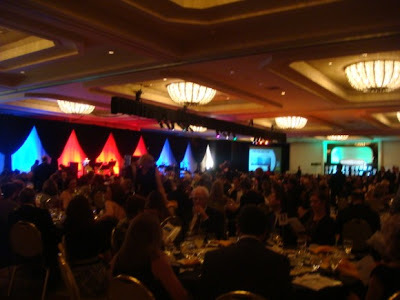 This year , gala night happened at The Omni Mandalay hotel in Los Colinas and attended by about 700 people, hosted by Lliza Shlesinger ’01 Winner of NBC’s Last Comic Standing. She is excellent with fun stories. 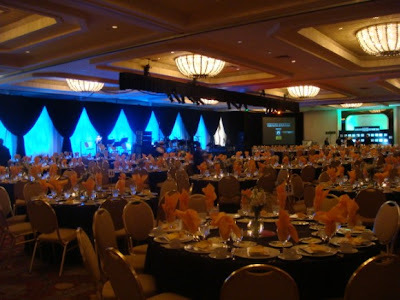 The gala was great, lots of parents enjoyed it and had alot of fun. It was a black-tie school’s party, so I dressed conversative and classic for the event. Wearing: Alaia dress, Miu Miu shoes. 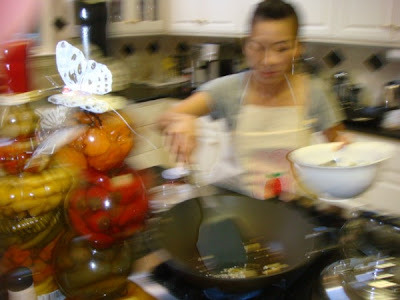 Many of you probably have seen Bizarre Foods on Travel channel or Fear Factor on channel 5 NBC . They once mentioned about Durian. It is referred to as the “King of fruits”, widely-known in southeast Asia. 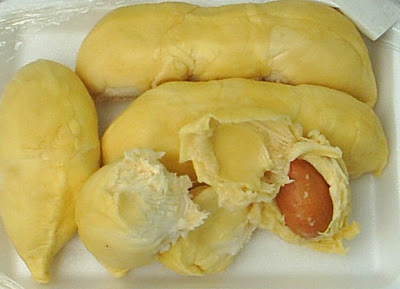 Durian is seasonal, native to Indonesia, Malaysia and Brunei . 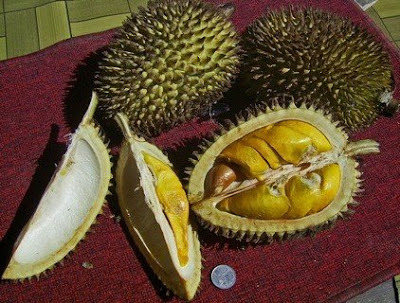 Vietnam and The Philippines also grow durian. It is not native to Thailand, but the country is currently one of the major exporters of durians. 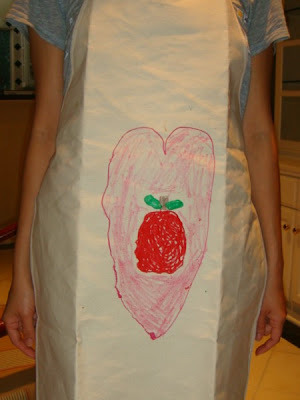 It is not easy fruit to enjoy because of its odor. Many people express diverse and passionate views ranging from deep appreciation to intense disgust. Many people describe its odor as kitty-cat litter, leaked gas, garnished with a gym sock. It can be smelled from yards away, and in Asia it is banned in public places such as hotels, malls, subways, airports because of its odor not being pleasant to tourists. On the contrary, many people in southeast Asia love its odor and its taste. The same goes for flavor. You either love it or you could not handle it . 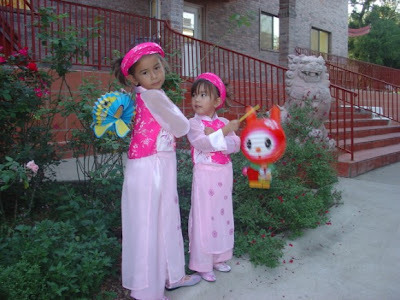 The flavor is used in a wide variety of foods, such as in ice-cream, milkshakes, mooncakes, and cakes. Picking durian to see if it’s ready to eat is an art. Some smell the bottom of the stem. If it emits a strong smell, then it ‘s ready to consume. Some hit the fruit with a stick and hear the appropriate slightly hollow “thunk” sound. It has concentrated sweetness, has a succulent, creamy filling, and is so unique that you have to taste it to see for yourself. My husband, who is an American, likes to try everything, and odd foods from different countries. He discovered that durian goes well with cognac, it complements the durian odor, and believe it or not, he really loves it. We both enjoy having durian or chocolate with cognac to watch our favorite show ” Gossip Girl” on Monday night. 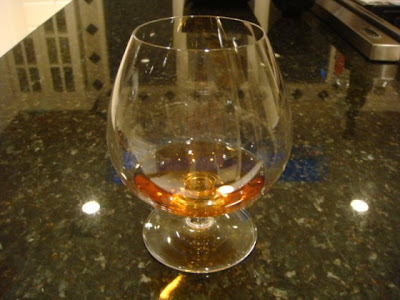 A glass of cognac goes with it perfectly. Hello everyone. How are you doing today? Are you hungry yet? Because I’m about to show you guys some food pictures that we had for modern Japanese food. 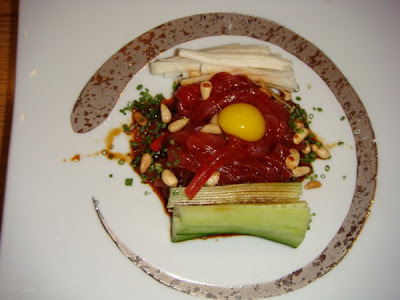 Korean style tuna: It’s prepared with raw quail egg, cucumber, heart of palm, sesame oil. It had the sweetness of brown sauce and sesame oil aroma, a sprinkle of pine nuts on top was perfect for combination . 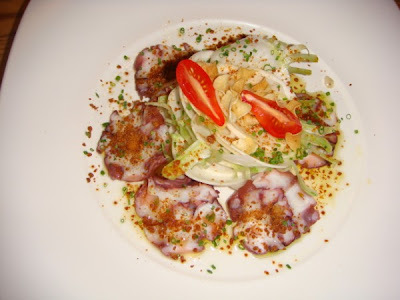 Octopus with Japanese turnip. Japanese turnip is the best, tastes very naturally sweet and unbelievably juicy, I love its freshness and it is healthy. Blue Hawaiian prawn is seasonal. I love its tenderness and is usually sweeter than normal prawn. 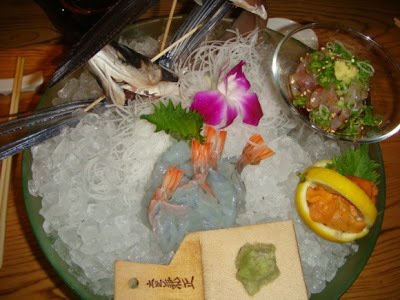 Flying fish sashimi with ponzu sauce in champagne glass: the chef added some jalapeno for spiciness, a little sea salt which enhanced the taste of sweet, sour, salt, and spicy. Wow, it really wakes you up . In the lemon basket is sea urchin which tastes sweet and creamy, so fresh like they just got them straight from the ocean. I haven’t tasted sea urchin this fresh before. It usually has a bitter, fishy taste which prompted me to question the chef about those often off-flavors. He told us that some companies use too much chemicals on it to keep the fresh color that affected the taste which also low quality, that makes sense. The finest sea urchin, or Uni as it is known in Japanese, use no such chemicals, leaving the Uni to its own sweet, natural flavor. At the end, we had a light desert. 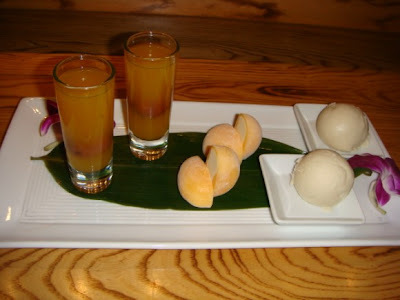 They were passion fruit sakay, passion fruit mochi , and Pina Colada ice cream. Wearing: Comme des Garcons collar and top, Balenciaga legging, Givenchy boots and bag. Cuff and rings from F21.